Helicobacter pylori (H. pylori) has been etiologically linked with primary gastric lymphoma (PGL) and gastric carcinoma (GC). There are a few reports of occurrence of both diseases in the same patient with H. pylori infection. We report a patient with PGL in whom the tumor regressed after surgical resection combined with eradication of H. pylori infection. However, he developed GC on follow up; this was temporally associated with recrudescence / re-infection of H. pylori. This is perhaps first report of such occurrence. Possible cause and effect relationship between H. pylori infection and both PGL and GC is discussed. This case also documents a unique problem in management of PGL in tropical countries where re-infection with H. pylori is supposed to be high. Helicobacter pylori (H. pylori) has been etiologically linked with primary gastric lymphoma (PGL) and gastric carcinoma (GC) [1, 2]. Evidences in favor of cause and effect relationship between H. pylori and PGL include: higher frequency of isolation in PGL than in controls ; development of the disease during long-term follow up of infected subjects ; regression after eradication of the organism ; and rapid recurrence following re-infection . Therefore, all components of Koch's postulates for establishing cause and effect relationship between H. pylori and PGL are fulfilled . Evidences in favor of etiological relationship between H. pylori and GC are somewhat incomplete. In most studies from developed countries H. pylori infection has been correlated with GC ; however, the data from developing world where H. pylori infection is more frequent and is acquired at an early age is somewhat contradictory [9, 10]. There is no report of regression of GC after eradication of H. pylori. Recently, GC has been shown to develop in Mongolian gerbils after infection with H. pylori. However, development of GC during follow up after fresh infection with H. pylori in humans has not been documented despite such report in PGL . Accordingly we report a patient with PGL from India in whom surgical resection of the tumor combined with eradication of H. pylori was followed by regression of PGL. This patient developed metachronous GC associated with recrudescence / re-infection of H. pylori. A 32-year-old man presented in May 1998 with epigastric pain of six months duration. The pain was constant without any relation to meal or radiation to back. He also complained of anorexia, weight loss, vomiting of copious amount of stale food without any bile for four months. Melena occurred once three months ago. There was no history of fever. He denied history of gastric cancer in his family. Physical examination revealed emaciation and pallor. There was no lymphadenopathy, hepatosplenomegaly and abdominal lump. Examination of throat did not reveal any abnormality. Hemoglobin=85g/L, TLC=6.7 × 109/L, ESR=78 mm/h. Chest radiograph was normal. Abdominal ultrasonogram did not reveal lymphadenopathy, hepatosplenomegaly or ascites. Upper gastrointestinal (UGI) endoscopy revealed hyperemic lower esophageal mucosa with multiple non-confluent erosions; there was excessive food residue inside the lumen and multiple hypertrophied gastric folds with erosions over these. Pyloric orifice was narrow and endoscope could not be negotiated into the duodenum. Six biopsies taken from the hypertrophied folds revealed only chronic inflammatory infiltrate and no specific pathology. H. pylori was not detected on histologic examination of gastric biopsies. In house rapid urease test (RUT) was positive within 15 minutes and scanning electron microscopy (SEM, Hitachi S530, Japan) from biopsies obtained from relatively normal looking areas revealed multiple round cells (might be lymphocytes, figure 1A) but no H. pylori. Serum titer for IgG antibody against H. pylori using ELISA based commercially available kit (Monobind Incorporation, California) was positive (21 IU/ml). Lansoprazole was started. With a diagnosis of gastric outlet obstruction, surgery was done after 2 weeks. After exploring the abdomen by midline incision thickening and nodularity of antrum were detected. There was no regional lymphadenopathy. Partial gastrectomy, removal of peri-gastric lymph nodes, closure of resected end of the duodenum in double layers and end-to-side ante-grade retro-colic gastrojejunostomy were done. Postoperative course was uneventful. Histological examination of resected specimen revealed transmural infiltration by mononuclear cells diffusely extending through muscularis mucosa into the submucosa without formation of lymphoid follicles, cellular atypia, abnormal mitotic figures (figure 2A) and lymphoepithelial lesions. On thorough histologic evaluation no evidence of synchronous GC was seen. Peri-gastric lymph nodes were not infiltrated by lymphoma. Bone marrow examination did not reveal any abnormality. On the basis of these morphological features a diagnosis of PGL (low-grade B cell lymphoma of MALT type by revised European-American classification) , stage I E: I1 (Musshoffs modification of Ann Arbor classification)  and H. pylori infection were made. Patient was treated with amoxycillin 1.5 g/d, omeprazole 40 mg/d and tinidazole 1 g/d for two weeks to eradicate the infection with H. pylori. UGI endoscopy repeated one month after completion of anti-H. pylori treatment revealed small sized stomach, no ulcer. RUT and Giemsa staining of biopsies obtained from proximal stomach were negative for H. pylori. However, a repeat UGI endoscopy done after six months revealed a benign-looking ulcer (1.5 cm in diameter) at gastrojejunostomy stoma. RUT and histology (Giemsa stain) on biopsies obtained from proximal stomach for H. pylori were still negative. Biopsy obtained by well technique from margin of the ulcer revealed chronic inflammatory infiltrate. Flow cytometry by standard technique  from these biopsies using anti-CD 19 (B cell marker) and anti-CD3 (T cell marker) monoclonal antibodies revealed polyclonal infiltrate with 6.6% CD 19 and 10.8% CD3 bearing cells (figure 3). With a possibility of benign stomal ulcer patient was treated with lansoprazole 30 mg/d for 3 months. After this period of treatment, healing of the ulcer and absence of H. pylori infection were documented by UGI endoscopy and negative RUT respectively (2 weeks after stopping lansoprazole). On follow up during the next six months, he remained well with improved appetite and weight gain (35 to 46 kg). He presented with recurrence of epigastric pain, anorexia and vomiting in August 1999. He had lost body weight (34 kg in August 1999). Examination revealed pallor, no peripheral lymphadenopathy and abdominal lump. UGI endoscopy: friable ulcerated growth involving most of stomach with reduced distensibility of the organ and patent gastrojejunostomy stoma. 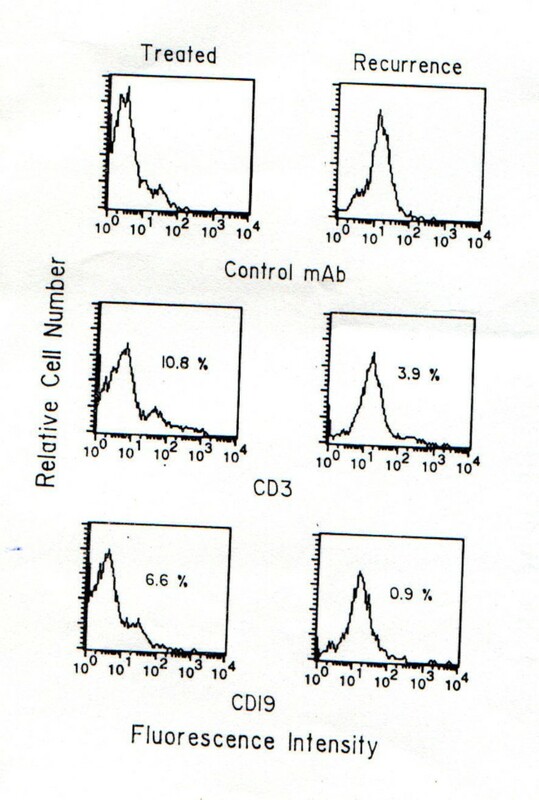 Since a possibility of recurrent PGL was considered, flow cytometry was done by standard technique  with biopsy from the tumor using anti-CD 19 (B cell marker) and anti-CD3 (T cell marker) antibodies; it revealed a polyclonal lymphocytic infiltrate consisting of 0.9% CD 19 and 3.9% CD3 bearing cells (figure 3). Biopsies obtained from relatively normal looking mucosa of stomach gave positive result to RUT. Histological examination revealed chronic gastritis but no intestinal metaplasia. 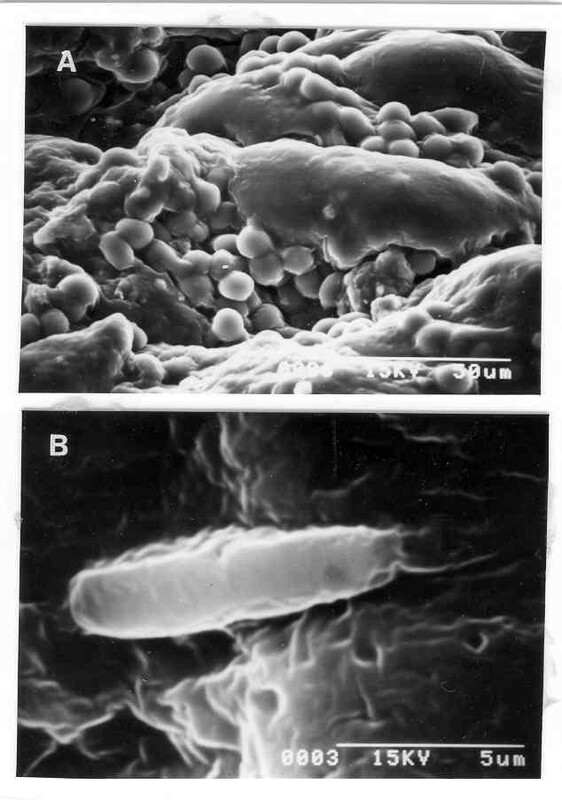 SEM (Hitachi S530, Japan) with these biopsies revealed multiple bacilli suggestive of H. pylori (figure 1B). Histopathology of biopsy from margin of ulcers revealed multiple signet ring cells, cellular pleomorphism, mucin secretion, abnormal mitotic figures and gland formation at certain places (figure 2B). A diagnosis of GC and recrudescence / re-infection of H. pylori were made. Patient denied further treatment at this stage and left the hospital. (A) Scanning electron microphotograph of gastric mucosa at presentation showing multiple round cells (possibly lymphocytes) but No H. pylori (× 1000). (B) Scanning electron microphotograph of gastric mucosa during re-infection showing bacillus with polar flagella suggestive of H. pylori (× 8000). (A) Resected specimen of distal stomach showing diffuse infiltration by mononuclear cells without formation of lymphoid follicles with obvious cellular atypia and abnormal mitotic figures (H&E × 275). (B) The high power view of recurrent gastric tumor showing pleomorphic cells, abnormal mitotic figures, mucin secretion and formation of gland at places diagnostic of adenocarcinoma (H&E × 275). Flow cytometry was performed using FACS calibur (Becton Dickinson) and data were analyzed using Cell Quest program. One parameter histogram is shown. High index of suspicion is required for early diagnosis of PGL in developing countries. Endoscopic features of PGL may be very non-specific. Endoscopic findings like slight increase in thickness of gastric folds, multiple benign looking gastric ulcers or erosions  are too non-specific to suspect the disease unless endoscopist specifically looks for it. Endoscopic mucosal biopsy may miss the diagnosis  and may show only benign looking lymphocytic infiltrate as in the present case. Molecular diagnostic methods essential for confirming the diagnosis are not widely available in developing countries including ours. Early diagnosis is important, as eradication of H. pylori has been commonly shown to cause regression in an early stage of the disease . H. pylori has been found more often in patients with PGL , chronic H. pylori infection progresses from polyclonal lymphocytic proliferation to PGL , and its eradication leads to regression . Recurrence of PGL following re-infection with H. pylori following eradication has been documented in the literature . Presence of H. pylori infection in our patient at presentation was evidenced by positive RUT (sensitivity 92%, specificity 80%)  and serology; absence of organism in SEM might be due to sampling error as similar phenomenon has been reported earlier in presence of gastric atrophy and intestinal metaplasia, both being common in chronic gastritis and malignancy . Though, biopsy was obtained from endoscopically normal-looking mucosa, SEM showed round cell infiltration suggesting involvement by lymphoma. Absence of H. pylori in that area is quite expected. Diagnosis of PGL in our patient could be further confirmed by molecular biological methods before eradication of H. pylori. However, typical histology picture is quite diagnostic of PGL . We could demonstrate clinical and histologic regression of the disease following surgical resection followed by eradication of H. pylori (documented by negative RUT and histology obtained from unresected proximal stomach). Flow cytometry of gastric mucosal biopsy documented polyclonal lymphocytic infiltrate confirming absence of residual lymphoma. Molecular evidences of the neoplasm may persist after treatment despite histological regression . However, eradication of H. pylori removes growth stimulus for PGL. Histological and molecular relapse in absence of re-infection with H. pylori are rare and transient . Our patient developed GC on follow up after regression of PGL. This was temporally associated with re-infection with H. pylori. Positive RUT and demonstration of typical bacilli in SEM documented re-infection. Since we could not demonstrate a different genotype of H. pylori at the time of re-infection a possibility of recrudescence of earlier infection can not be entirely excluded though seems less likely. Development of intestinal metaplasia, a precursor of GC  and advanced cancer  has been reported after infection with H. pylori in Mongolian gerbils recently. This is perhaps the first report of development of GC following recrudescence / re-infection with H. pylori in human. We can not rule out a possibility of spontaneous development of GC. However, this seems less likely as in most cases of combined tumor reported earlier GC and PGL were synchronous in nature [24–29]. 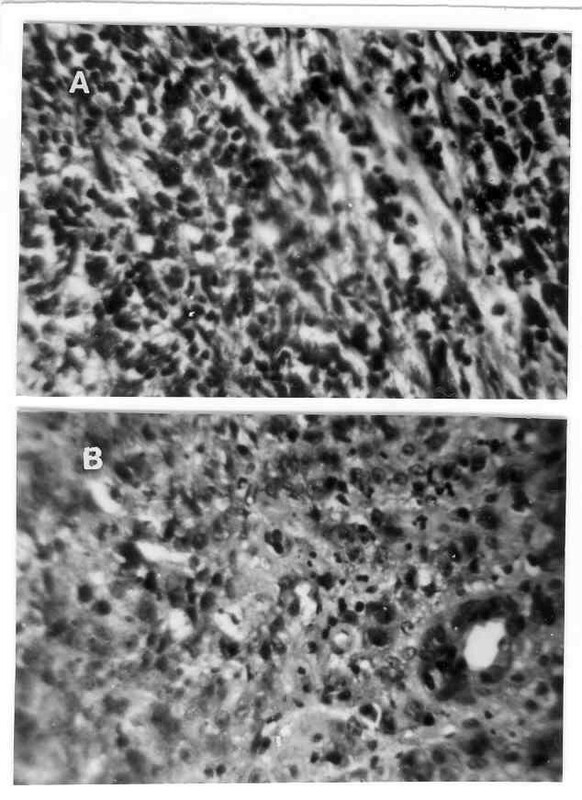 In a single series of 12 cases two developed metachronous tumor in both of whom GC preceded PGL . In contrast, development of GC is expected to occur later in the course of H. pylori infection in patients with PGL . The latter develops in the active phase of inflammation whereas the former in the pre-atrophic stage of gastritis . In our patient resected specimen of PGL on thorough histologic examination did not reveal presence of synchronous GC. Therefore, as expected, GC in our patient developed later and was temporally associated with recrudescence / re-infection with H. pylori. Occurrence of metachronous GC after regression of PGL with eradication of H. pylori has been reported rarely [31, 32]. Four cases of metachronous GC after regression of PGL with H. pylori eradication have been reported till date [31, 32]. Development of GC in our patient was temporally associated with re-infection with H. pylori following regression of PGL. This is perhaps the first report of such an association. Considering several earlier studies [33, 34], which suggested reduction in risk of GC following H. pylori eradication, temporal association of development of GC with recrudescence / re-infection with H. pylori in our patient is not difficult to explain. However, development of GC within a short period of time after fresh infection with H. pylori is somewhat odd as GC takes time to develop after infection with H. pylori. A possibility of genetic or immunological predisposition can not be excluded. Further, since the patient was already chronically infected with H. pylori he might have been predisposed. Some workers have suggested a possibility of immunological containment of dysplastic epithelial cells by lymphocytic infiltrate . Whether immunological imbalance resulting from regression of lymphocytic infiltrate could contribute to rapid development of GC, which got further triggered by re-infection or recrudescence of pre-existing infection with H. pylori remains an open question. Development of GC in this patient might be related to changes induced by many years of H. pylori related gastritis rather than a few months of re-infection. However, since there was a temporal relation with re-infection, it could also be related to progression of existing changes induced over many years by re-infection. This remains a conjecture. In conclusion, we have shown regression of PGL after surgical resection combined with eradication of H. pylori and development of GC in association with reinfection with H. pylori in the present case. This may suggest the possibility of cause and effect relationship of both these malignancies to H. pylori. This case also highlights a unique problem in management of PGL in tropical countries where re-infection with H. pylori is supposed to be high . We thank relatives of the patient for giving us written consent for publishing the patient's details.